David Stevenson's new book links the meteorology of the Earth to that of other planets, stars, and clusters of galaxies, showing the similarities and differences between terrestrial weather and that of weather on other worlds. 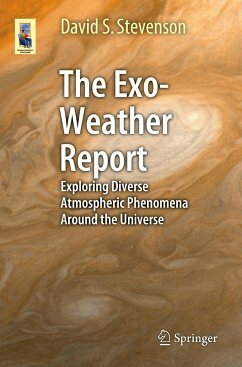 Because Earth is not unique in having weather, there is much to learn from other planets with atmospheres that show the movement of energy from hotter to colder areas. The weather seen on Earth and other known planetary systems are examined to elaborate the connection between climate and the development of life. The weather on Earth and other Solar System planets is a manifestation of the huge energy budget imparted by our star, the Sun, but weather doesn't stop at the shores of our Solar System. The author brings together the latest information from satellites and probes, such as Cassini and Hubble, to show its larger place in the astronomical picture. Inferences are drawn about the weather and climate of a large number of other planetary systems that lie far from our own. Additionally, the author expands our understanding of what exactly weather is comprised of by exploring the kind of "weather" experienced on the largest observable scales in the universe. David Stevenson was born in Paisley, Scotland, in 1968, and studied molecular biology at Glasgow University and a PhD in genetics from the University of Cambridge. After a stint in academia, he became a teacher, but continued to write science articles for various magazines such as Sky & Telescope. His publications with Springer include "The Complex Lives of Star Clusters" (2015), Extreme Explosions (2014) and "Under a Crimson Sun" (2014). Despite a background in Biology, David's father inspired his interest in astronomy from an early age. Exploring the cross-roads of different scientific disciplines is a key interest and motivation in both teaching and writing. David lives in Nottingham, UK, with his wife and family. Part I Learning by Observing our World.- Introducing Earthly Meteorology.- Tales of Mass Destruction.- Part II - Other Worlds in the Solar System.- Venus.- The Wispy Weather of Mars.- The King of Planets.- The Ring World.- Uranus.- Neptune, Pluto and the Kuiper Belt.- Part III - Beyond our Solar Realms.- Tales of Other Worlds.- Stellar Weather.- Storm Fronts in Galaxy Clusters.- Glossary.- Bibliography.